A swirling labyrinth of cardboard conceals sculptures by Italian artist Michelangelo Pistoletto at the Serpentine Gallery in London. Entitled The Mirror of Judgment, the recently opened exhibition displays artworks that represent Christianity, Islam, Judaism and Buddhism. 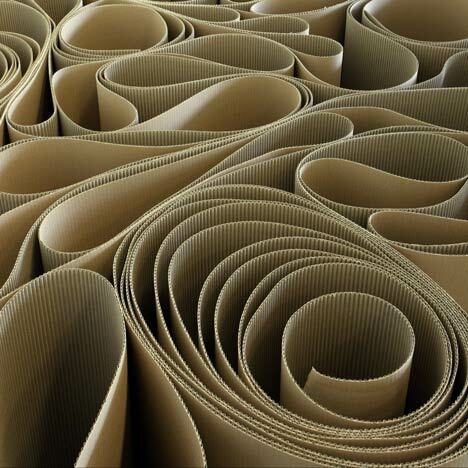 The corrugated cardboard maze stands at around shoulder-height. Pistoletto, who is famed for using reflective surfaces in his work, has positioned mirrors beside the sculptures to reflect the wiggling cardboard. The exhibition continues until 17 September and coincides with Peter Zumthor's Serpentine Pavilion, a temporary summer shelter that is located just outside. More details about the pavilion in our earlier story. Photographs are by Sebastiano Pellion. A new exhibition by leading Italian artist Michelangelo Pistoletto opens this summer at the Serpentine Gallery. Winner of the Golden Lion Award for Lifetime Achievement at the Venice Biennale in 2003, Pistoletto is acclaimed worldwide as a key figure in the development of conceptual art and as a founder of the influential Arte Povera movement. For his exhibition at the Serpentine, titled The Mirror of Judgement, the artist has devised a labyrinth that guides visitors through the Gallery’s interior where they discover a series of sculptural works. He describes the labyrinth as ‘a winding and unforeseeable road that leads us to the place of revelation, of knowledge.’ Pistoletto’s maze alters the viewers’ understanding of the architecture and makes each one a fundamental part of the work itself. Throughout his career, Pistoletto has worked as a theorist and activist using art to inspire and produce social change. In 2004 he announced the most recent phase of his work, the Third Paradise, an imagined new level of human civilization. The exhibition will include elements from the Third Paradise series and representations of four major religions; Christianity, Islam, Judaism and Buddhism. Born in Biella, Italy, in 1933, Pistoletto began as a painter in the mid-1950s and in the 1960s received critical acclaim for his series of Mirror Paintings. These works broke down the traditional notions of figurative art by reflecting their surroundings and the viewer as a part of the image, linking art and life in an ever changing spectacle. The exhibition at the Serpentine continues the artist’s exploration of participation. In the late 1960s, Pistoletto established The Zoo, a workshop open to artists, filmmakers, intellectuals, poets and the public that centred on collaboration and performance. The projects he worked on with The Zoo were closely entwined with his individual studio practice, combining material form, pictorial space and theatrical gesture. This focus on participation developed in 1998 with the creation of Cittadellarte: Fondazione Pistoletto, a centre for the study and promotion of creativity of all kinds. This interdisciplinary approach is an intrinsic part of his goal to unite the diverse strands of human civilisation through art. Also on view is the Serpentine Gallery Pavilion 2011 designed by Peter Zumthor, 1 July – 16 October.